If you're wondering if there were trees growing in downtown Phoenix before the very first building was built there, in the 1870s, yes there were, and they were mesquite. And while they were the same mesquite that you may have growing in your yard today, they were growing naturally, and weren't trimmed up to look quite so "treelike" because that really isn't how they grow naturally. Naturally they tend to grow more sideways than up, which you can still see in riparian areas in the desert. The word "riparian" is just a fancy word meaning an environment where water flows sometimes. I usually just call them washes, and the bigger ones are marked on maps around Phoenix as rivers. And if you've spent much time outdoors in the Phoenix area, you know that washes in the desert can be dry in the summer, raging rivers in the rainy season, and muddy at other times. And certain plants grow there naturally, one of them being mesquite. And if you go back in time to before the first building was built at the Phoenix townsite, which centers at Washington and Central, you'd see a large amount of mesquite. And that's because the area was a floodplain, both from the flooding of the Salt River, and the flooding of Cave Creek (the creek, not the road, or the city). Those two riparian washes came together just west of what is now downtown Phoenix, and that's why there was a mass of mesquite growing there. The floodplains have long since been controlled, but they're still very visible as you fly over Phoenix, especially the floodplain of the Salt River. So if you want to see what Phoenix looked like before the first building was built, just go anywhere in the Sonoran Desert where there's a riparian wash. There you'll see stands of mesquite, along with various other plants that grow naturally where they can get enough water to grow. 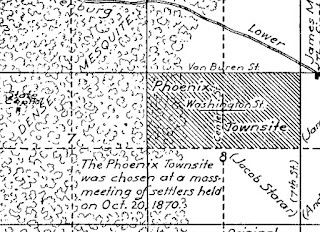 Of course, the mesquite had to be cleared away from downtown Phoenix, but the pioneers immediately started planting trees. Lots of trees! And the trees grew well, both with well water and water from the canals. And the farmers planted a lot of crops, and more trees, and the rest, well, is history. Thank you for visiting the Phoenix Townsite in 1870 with me! Hand me that machete, I need to clear some mesquite! 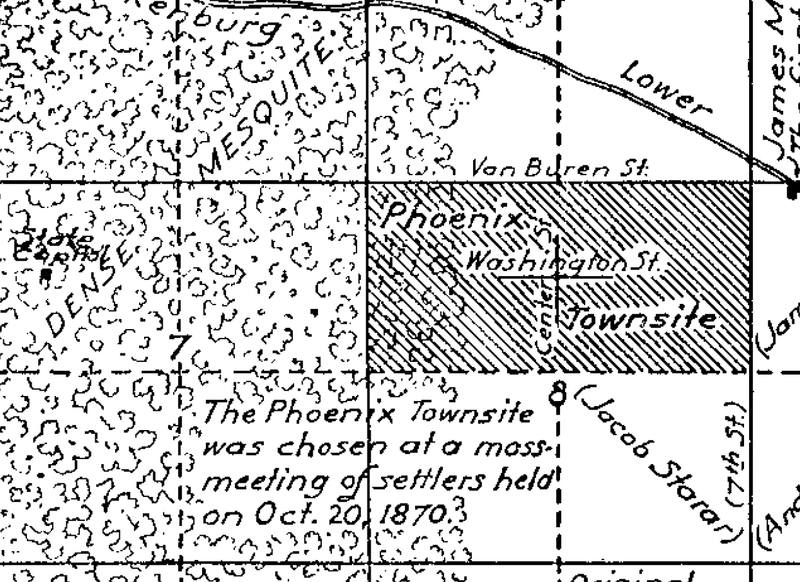 Image at the top of this post: map of the Phoenix townsite, 1870. Note the mesquite west of Central, and west of town (7th Avenue).